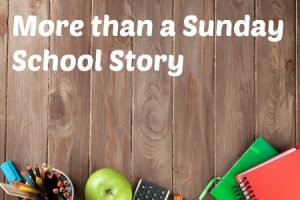 If you grew up attending Sunday School, you will remember all of the great Bible stories that were part of the regular Sunday School fare. There were the heroes such as Noah, who built the ark, Moses, who led the Israelites out of Egypt, or Esther, who rescued her people from evil Haman. And then there were the villains, such as Cain, who killed his brother, King Saul, the dethroned king of Israel, or Herod, the bad ruler who killed so many young Jewish boys. And there were some, such as Samson, who were promoted as heroes when, in fact, they probably belonged more in the villain category! Upon reflection, though, I wonder whether there is something amiss in the telling of those stories. For one, they are often told in a way that nearly leaves God out. Instead, the focus is on how great (or evil) the individual is. Perhaps it would be helpful to consider that their actions, however heroic or villainous, were a reflection of their hearts’ response to God. Perhaps there is deeper meaning behind their stories than just a way to keep children entertained during Sunday School. David, the shepherd boy who took on the giant, Goliath, is one such Sunday School hero. Children are told how brave David was to go after a huge giant with only a slingshot. But let’s look a little deeper. When King Saul questioned David’s ability to go and fight the giant, David responded, “The LORD who delivered me from the paw of the lion and from of the bear will deliver me from the hand of this Philistine” (1 Samuel 17:37). David’s confidence was not in his mad slingshot skills, but in God. And when Goliath mocked and threatened him, David again pointed to the Lord, saying, “You come to me with a spear and with a javelin, but I come to you in the name of the LORD of hosts…” (1 Samuel 17:45). This was not an insignificant statement for David, for he knew that the name of the LORD encompassed all that God is—His heart, His character, His being. It’s also important to note the contrast between David and the other Israelites. For 40 days the Israelite army had lined up for battle against the Philistines. They looked like warriors. They were dressed in battle gear. They had their weapons. They were supposedly God’s army. And yet every time Goliath came out to challenge them, they ran away in fear. But David—though he didn’t look the part of a soldier at all—“ran quickly towards the battle line” (1 Samuel 17:48). I wonder if there’s a lesson here for us. How many times do we look the part of “good Christians” but run at the first sign of adversity? David messed up. He messed up big time. He had an adulterous affair with another man’s wife and then had the woman’s husband killed to cover it up. There’s no way to sugar coat that episode in David’s life. It was bad. Yet, when David was confronted with his sin, he responded by saying, “I have sinned against the LORD” (2 Samuel 12:13). His repentant heart is evident in Psalm 51, where he writes, “Have mercy on me, O God, according to your steadfast love; according to your abundant mercy, blot out my transgressions. Wash me thoroughly from my iniquity and cleanse me from my sin.” Where does David turn when he has blown it? To the God he knows and loves. To the God he knows will forgive and heal. David was a man who knew God, yes, really knew Him. And his heart longed to know Him ever more deeply. He had experienced God’s overflowing love, and loved God in response. All of David’s strength, courage, and hope were found not in himself, but in the God he knew so well. So as we consider the heroes and villains of Sunday School Bible stories, let’s look beneath the surface. What really made the difference in the lives of these men and women was their hearts’ response to God’s love, goodness, and mercy. My prayer today is that the Lord will give us hearts that respond like David’s. May we, like David, love God and long to know Him with ever-deepening intimacy. Thank you, Gretchen. And thank You, God, for sharing these insights with us. My heart echoes your prayer at the end!